Market conditions appear to be tightening with new listings down compared to last year, the real estate board's president said. 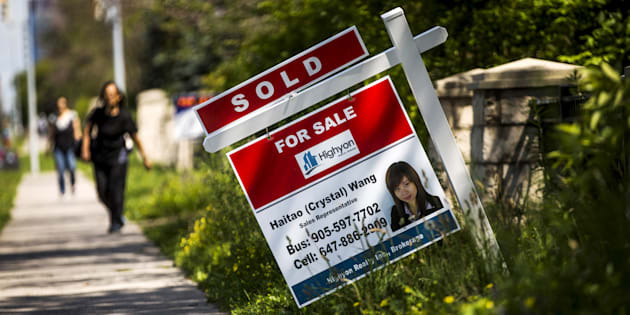 A woman walks towards a "for sale" sign of a home that has been sold in Toronto, June 29, 2015. TORONTO — Home sales in the Greater Toronto Area rose 2.4 per cent in June compared to the same month a year ago, and were 17.6 per cent higher compared to May, according to the latest data released Thursday by the Toronto Real Estate Board (TREB). The slight year-over-year increase followed a steep sales drop of 22.2 per cent in May across the GTA compared to May 2017, reflecting what TREB says is a continuing trend of volatile buyer reaction to various policy changes impacting the market. The board said 8,082 homes changed hands in the GTA in June, with the average selling price edging up by two per cent on a year-over-year basis to $807,871. Sales of detached homes led the way, with the board reporting 3,589 sales at average price of $1,033,574. TREB said 2,234 condos were sold during the month for an average of $561,097. Board president Garry Bhaura said market conditions appear to be tightening with new listings down compared to last year. At the same time, said Bhaura, home buyers are starting to move back into the market, with sales trending up from last year's lows. Jason Mercer, TREB's director of market analysis, says the board expects to see sales improve over the next year although issues surrounding the supply of listings will persist. "This suggests that competition between buyers could increase, exerting increased upward pressure on home prices," he said. Bhaura said the board looks forward to working with the new Ontario government to ensure home ownership and affordability are a top priority. "In this regard, one of the most important issues is ensuring that no new municipal land transfer taxes are imposed on home buyers." he said. In the City of Toronto in June, 3,096 homes were sold at average price of $870,559 while 4,986 homes were sold in the rest of the GTA at an average price of $768,945.